Tucked between central Washington’s Cascade Mountains and the Columbia River lies Mike and April Clayton’s orchard. Each year, the Claytons and their two young children manage 80 acres of apples and 65 acres of cherries. They grow thousands of pounds of fruit that ends up in grocery stores as fresh and preserved foods. But what happens to the fruit they can’t sell or donate? 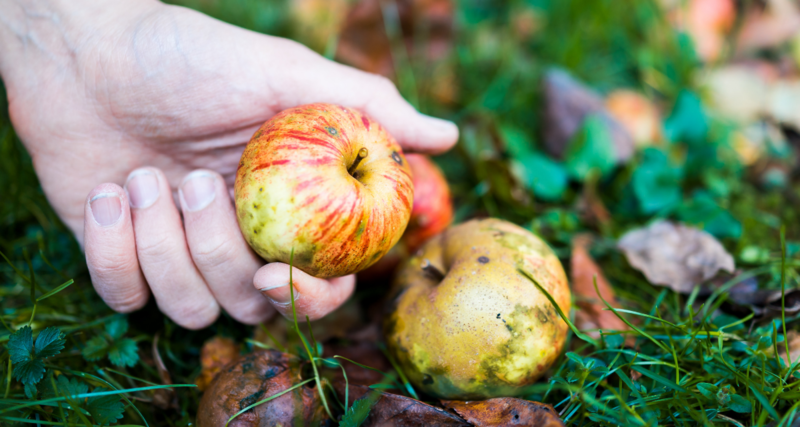 After each harvest, the Claytons invite their friends and neighbors out to the orchard to glean what’s left and celebrate the end of the growing season with cider parties. They enjoy sharing the fruits of their labors and ensuring the nutritious and fresh food they grow doesn’t go to waste. The Claytons aren’t the only ones who use gleaning to fight food waste. More and more farmers and organizations are working together using this simple practice to turn potential waste into nutritious rewards. Gleaning means to gather slowly and involves going out into fields after a crop has been harvested to pick up and enjoy what’s left. Each year, about 6 to 7 percent of planted crops in the U.S. aren’t harvested due to a variety of factors that do not affect food safety. Gleaning helps put that food on people’s plates, instead of adding to landfills. According to a study by Cornell University’s SC Johnson School of Business, the benefits of gleaning are twofold. It can improve the nutritional status of food insecure people by giving them access to fruits and vegetables, while simultaneously reducing food waste. Most gleaning happens through organizations that work with farmers and volunteers to collect the food and donate it to food banks that serve the needy. Since food pantries are often oversaturated with canned and packaged foods, they welcome the fresh, nutritious produce straight from the farm. The Society of St. Andrew (SoSA) is a great example of how gleaning can be used to fight food insecurity and waste. For more than 35 years, farmers have been working with SoSA to bring volunteers to their farms to gather leftover produce. Sometimes farm families do the picking themselves and drop truckloads of food off for volunteers to deliver. Each year, SoSA, its volunteers and farm partners prevent 30 million pounds of food from being wasted in landfills. In addition to its Gleaning Network, SoSA also coordinates Harvest of Hope and the Potato and Produce Project with the mission of bringing people together to harvest and share healthy food, reduce food waste and build caring communities by offering nourishment to hungry neighbors. If you’re inspired to start gleaning in your community, check out the USDA’s Let’s Glean toolkit. It breaks down the process of starting a program with tips on how to seek farm donors, identify food shelf partners that accept fresh produce and recruit volunteers. You’ll also learn how to prepare for your first glean and the steps it takes to keep it growing. Gleaning is just one way farmers practice sustainability in their operations. Find out how the Halverson family curbs waste and cares for the environment at Black Gold Farms.